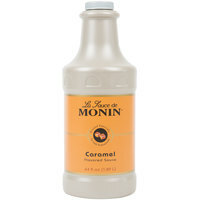 Quickly and easily add decadent flavor to anything you make with this Monin 64 oz. caramel flavoring sauce! This versatile sauce can be used as an ingredient, topping, or garnish for your top-selling drinks and desserts. Featuring a buttery, rich caramel flavor and golden color, this sauce has a thicker consistency than liquid flavoring syrup. It's great for swirling atop whipped cream or blending into frappes. It adds just the right amount of sweet flavor to any cup of freshly-brewed coffee. You can even use it to top ice cream, cheesecakes, and other signature desserts. The best caramel flavor on the market. I've ordered direct from Monin, and the price here is actually a little cheaper. As long as you're buying several at a time, the shipping is worth it! Monin is the best. This caramel sauce will make the creamy dreamy latte that you dream of. This sauce is in our top three base ingredients at our coffee shop. I was looking for a simmer product to add to iced coffee that the coffee shops and fast food establishments use when they add some sauce into the drinks. It was shipped fast, Packaged at an A+ level. The taste was great and size of bottle was good. The taste could of been 5 stars ,but ill error on the side cant exactly get the flavor I was seeking. I will buy again. Monin's caramel sauce is the perfect addition to our seasonal drinks. The quantity is fantastic for the price. We will continue to buy as a staple ingredient for our shop. We use the caramel sauce in our espresso-based drinks. You can't beat this price that Webstaurant is offering to their customers! Each case of 4 that you buy comes with a sauce pump - other sites make you purchase the pump at an additional cost. Very nice amount for the cost. Always our favorite flavoring sauce as it's easy to use and doesn't get too sticky like some of the other brands. This is such a great tasting caramel sauce. Very comparable to Ghirardelli. It has a really smooth creamy texture. Great for all desserts or coffee. The Monin caramel sauce is by far the best caramel for professional or home use. If you want to serve your customers the best machiattos or caramel lattes, Monin is a must. Monin caramel flavoring sauce is awesome and is a great sauce for dressing up dipped apples and sweet. Rich, thick sauce with a great flavor. An awesome style caramel flavoring sauce that is delicious and makes the best caramel for drizzling over desserts or coffee. The taste is amazing and taste like home made. In love with the caramel sauce from Monin. It is thick and creamy and great for drizzling over drinks or desserts. A great, butter taste. Monin puts out such an awesome product line....this caramel sauce is delicious and I would rate it above any other competitor currently on the market. Great taste for a great price! I use this as a topping on almost everything and I also use it for drinks. It pours easily into a squeeze bottle too! Did use torani sauces but have switched to monin. This seems to have a much better more authentic caramel flavor than torani did. Will be buying more. A wonderful tasting caramel sauce that is great for topping our pastries. It is also excellent for mixing with cream cheese for a caramel spread that is so good and decadent. We had a feeling that we were going to love this syrup. We use it on our desserts all the time. I even tried using it in my coffee the other day and it was really good. Just remember though that a little bit goes a long way, Other than that, it is absolutely delicious. We prefer Monin over several other brands because they don't use HFCS to make the caramel. It is nice and thick with a good flavor but not so thick that it can't be used with a pump. Being a barista, the caramel flavoring sauce is a must and this is the best. Great rich flavor and perfect for making our caramel macchiato. The Monin caramel flavoring sauce will be my downfall. I eat way to much of this and its delicious. A great pairing with fresh apples. Rich tasting caramel flavoring sauce from Monin. Great for making cappuccinos at home. The sauce is really good and very tasty. Great on ice cream too. This Monin caramel flavoring sauce is absolutely delicious. I use it on a lot of my desserts and even some in my coffee as well. A wonderful texture caramel sauce that is thick and creamy. A great sauce for putting over cheesecake and the whole family agrees its delicious. Great for dipping apples too. An amazing rich and buttery caramel sauce that is great for making our caramel pies. The sauce is thick and so tasty. So happy with the quality. Monin is a great brand, and the flavor of this caramel is great- not super sweet. This is great for a drizzle or to add into a buttercream- it does take a bit because it is not a super powerful taste. A very versatile product! All of our customers that visit our ice cream shops use this stuff. It is so good. We have nothing but great things to say about this sauce. It is perfect for anything. We had a church picnic and I made cheesecakes. I decided to do a topping bar and brought this caramel flavoring sauce with a pump attachment. It was a huge hit and people loved its taste. I was definitely the hit at the picnic. we using this caramel sauce as a drizzle for caramel macchiato or with the whip cream! it makes more deep caramel flavoring. we love a monin product! Delicious and creamy.. makes a great caramel latte. And, it tastes just like caramel apple dip! If you like a good caramel sacue, you can't go wrong with this one. Caramel Flavoring s one of the best sauce that can make any drink yummy. Whether it is a smoothie or Cappuccino, they are known for their delicious taste. BEST CARAMEL EVER! Every customer is impressed with this sauce. Anytime we use it in a drink, it's crowd favorite. We use it as a base for our coffee drinks and drizzle. It actually tastes like caramel without any artificial taste. It's not too sweet either, it's perfect. Monín 64 oz. Caramel-flavored salsa is amazing, we love this product, it's handy to grind it with the blender. we love it because the caramel is very creamy. Monin really knows how to make a great product. It's no surprise that the caramel sauce is so amazing!! And.. you can't beat the price!! Smooth and flavorful best describes this caramel Monin syrup. It doesn't have the overwhelming caramel flavor and artificial ingredients that many others contain. A wonderful product. This works well for making Caramel Macchiatos. I store mine in a plastic drizzle bottle to top my lattes with. I wouldn't say it's spectacular, but it's good and does what it's supposed to do. I've used the Torani Caramel sauce before, and I think I prefer the Monin over it. So glad I switched from Torani to Monin Caramel sauce. Just tasted them both, side by side. The Monin tastes like melted homemade caramels. The Torani is good but doesn't have quite the Caramel taste as the Monin, just sweet. We have tried other sauces and none compare to the quality and consistency that we are provided by using Monin sauces and syrups. A value that can't be beat. I bought this based on a co-workers previous use of the product. She loved using it, and so do I. Well worth the price, and good flavor.